Big Questions in Science- 1) What do tiny neutrinos reveal about the universe? 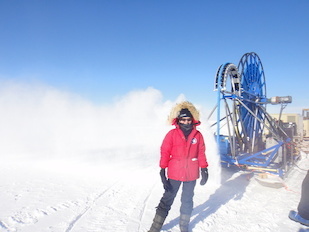 The thermometer reads -25o F, but that doesn’t stop Physics Associate Professor Kara Hoffman from putting on her parka and snow boots and heading into the frigid Antarctic air. While it may be winter break 2012 in College Park, it is summer at the South Pole and prime time for construction on Hoffman’s latest experiment. Donning a hard hat, Hoffman helps the crew drill 200 meters into the Antarctic ice to install a unique subsurface telescope covering nearly 100 square kilometers that can detect some of the tiniest particles in our universe—neutrinos. “Neutrinos are basic building blocks of our universe,” says Hoffman. By exploring their properties, she believes, we can learn more about the nature of galaxies and supernovae and unravel astrophysical phenomena occurring millions or even billions of light years away. Neutral and nearly massless, neutrinos move at light speed and are difficult to detect. They travel from space in straight lines without interacting with anything. In fact, billions of them pass through our bodies unnoticed every second. Through her work on two NSF-funded projects, Hoffman is expanding our understanding of these tiny particles, which could also tell us more about cosmic rays, high- energy protons that bombard Earth, some having more kinetic energy than a professional baseball pitch. Hoffman notes: “The question is: what could accelerate them to such high energies?” Tracking cosmic rays to find this celestial particle accelerator is elusive because the magnetic field along their path bends the electrically charged particles. But neutrinos offer a clue. Hoffman leads the development of the Askaryan Radio Array (ARA), a neutrino telescope that uses radio frequency, which transmits best through very cold ice, to detect the particles. Plans are underway for 37 subsurface clusters of radio antennae. In addition, she is a major contributor to the IceCube Neutrino Observatory, completed in 2010, which detects neutrinos inside a cubic kilometer block of ice at the South Pole. “Whatever produces cosmic rays should also be producing neutrinos,” says Hoffman. Traveling in straight lines, their origins are easier to discern. “If we can find some area of the sky where the neutrinos cluster—a twinkling spot of neutrinos—then we can figure out what is accelerating matter to such high energies,” says Hoffman.